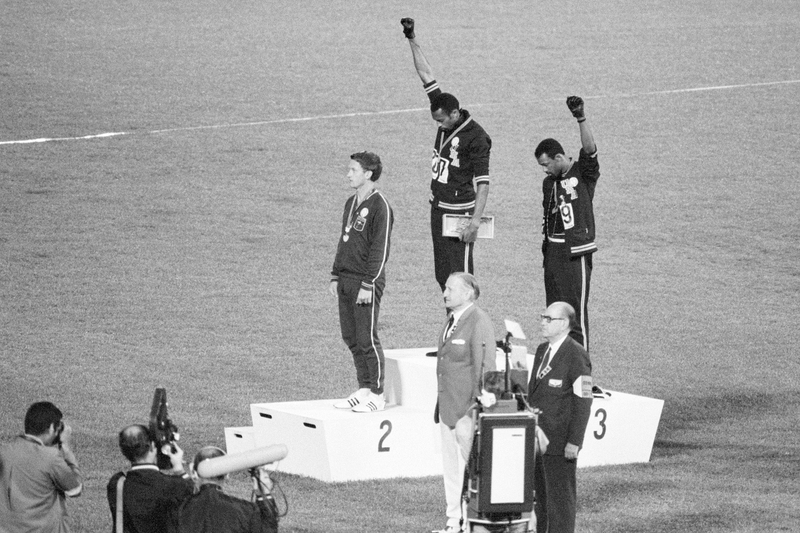 Nearly 48 years ago, USA Olympic sprinters John Carlos and Tommie Smith bowed their heads and raised black-gloved fists on the medal stands at the 1968 Mexico City Olympics as The Star-Spangled Banner played. The “Black Power salute” was actually later called a human rights salute by the then-young black men who made history that was both loved and hated at that time. There may not be an Olympic team in Rio de Janeiro that owns a bigger spotlight than the USA Basketball team, which is entirely composed of African-American players. And with veteran forward Carmelo Anthony very vocal as of late on the topic of race relations and the violence between African-Americans and police officers, Carlos and Smith believe the gold-medal favorite USA Basketball squad could make a big Olympic statement if it chooses to. “One of the best basketball teams have been put together,” Smith told The Undefeated at an event announcing the return of San Jose State University’s men’s track and field program on Monday. “You not only have one star, but you have a plethora of stars on that team. And each star has its own light to shine. And hopefully that light that they will shine will make a better picture of things that are extending out there in the world that needs light to be shone on. 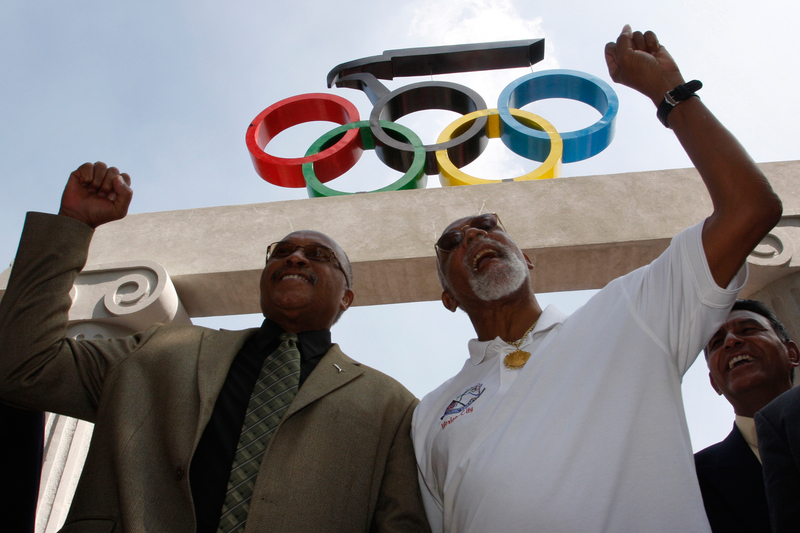 U.S. Olympic medallists Tommie Smith, left, and John Carlos hold up their fists at the Mexican Olympic Committee building in Mexico City, Wednesday, Oct. 15, 2008. “I would hope that they circumvent the circumstances of society and digest it and do what they feel is necessary for them to help alleviate the pain of so many people, not just in the United States, but around the world,” Carlos told The Undefeated at the San Jose State event. Smith and Carlos were immediately suspended from Team USA, banned from the Olympic Village and kicked out of the Mexico City Games by the International Olympic Committee (IOC) for their Black Power statement. So does Anthony have the strength to make a major political statement with the major risk involved? One provision of Olympic Charter Rule 50 states that no type of demonstration, political or religious, is allowed during the Olympics. Any violation of the clause may result in disqualification or withdrawal of accreditation of the person concerned after review by the IOC executive board. The U.S. men’s basketball team is projected to play in the gold-medal game on the last day of the Olympics, which would make expulsion for any political demonstration by Anthony or one of his teammates on the medal stand too late for impact. USA Basketball executive director Jerry Colangelo recently told The Undefeated he wouldn’t silence his team or tell them what to say. Anthony spoke to The Undefeated after USA Basketball’s final pre-Olympics exhibition contest, a 110-66 win over Nigeria on Monday in Houston. He said that he is very well aware of Olympic Charter Rule 50 and that he is not scared to make a political statement either. But the three-time Olympian believes a gold medal will make the strongest statement and he plans to adhere to Rule 50. “I know about that rule,” Anthony told The Undefeated. “We had a rule talk about the do’s and the don’ts. What you can do and what you can’t do. I know the basics of what I want to do and what I don’t want to do. But for me, I think I’ve laid the foundation down and laid the platform down where the best thing for me at this point is to win a gold medal and show our country that we are united through all these times. I think that’s the image I want to send out. Anthony was born on May 29, 1984, long after Carlos and Smith held their black-gloved fists in the air in Mexico City. The New York Knicks forward, however, is very knowledgeable about American black history and said he “knows a lot” about Carlos and Smith. Anthony also expressed strong respect for Australian silver medalist Peter Norman, who joined Carlos and Smith on the podium wearing a human rights badge on his jacket. Norman’s badge on the podium was in support of the Olympic Project for Human Rights and was borrowed from U.S. rower Paul Hoffman. Norman also suggested that Smith and Carlos share the black gloves used in the famous salute after Carlos left his pair in the Olympic Village. Norman died of a heart attack on Oct. 3, 2006, at the age of 64. Smith and Carlos gave eulogies and were pallbearers at his funeral. A week earlier, Anthony spearheaded an event at a Los Angeles youth center where the men’s and women’s U.S. Olympic basketball teams, community leaders, young adults and police talked in groups about the importance of respect, communication and safety. The nine-time NBA All-Star has been involved in social activism in the past, including walking in protest in his hometown of Baltimore last year to honor the late Freddie Gray, who died in police custody. In early July, Anthony awoke in the middle of the night and penned a 280-word Instagram post in which he said that the “system was broken” and called for sports superstars to spark a change. Anthony also joined fellow NBA stars LeBron James, Dwyane Wade and Chris Paul in putting a spotlight on violence and racial issues during the opening of The ESPYS on July 13. Carlos was very impressed by those collective star NBA voices. “It’s not just Carmelo Anthony. It’s LeBron. It’s Chris. It’s Wade. It’s all the individuals collectively,” Smith said. “I think this is a lifelong relay. This is not a moment with two people in 1968. It’s a movement. These young individual athletes are an extension of that movement. They have a vision on how things can be based, on how we felt at that time that is relative to the fact that I can’t be concerned about myself as much as I should be concerned about individuals who grew up in my community or the individuals who are suffering throughout the world for various reasons. Anthony said that the timing and the sport was “totally different” for Smith and Carlos than it is for USA Basketball now. Even so, Carlos and Smith hope that more athletes like Anthony will follow in their footsteps as the 50th anniversary of their statement approaches.